What can I do with channels analytics? Channels Analytics is a way to monitor your team's progress along each of your company's channels. In this getting started article, we'll give a basic overview of some of the data and report features available. Note: Both Enterprise and Professional group plans can access channels reports. 2. What can I do with channels analytics? In this getting started article, we'll give a basic overview of some of the data and report features available. Enterprise users have additional channels analytics features. Learn more in the getting started with advanced channels analytics article. To get started, log in to your Pluralsight account and click on the Analytics link in the left pane navigation. Next, click the Channels link in the top center panel. Tip: You can also get to channels analytics from your Account Dashboard. Scroll down to the channels visualization, and click the Details link. A: List of channels, including channel creator, length of courses in channel (duration), members, last activity, and average completion. You can add interactive courses and projects to channels, as well as video courses & articles outside of Pluralsight. B: Search & filter. Type in a channel name, objective, or owner to see only those channels. C: More than 1 member. By default, we display only channels with more than 1 member to improve page load time. To see all channels, click the >1 member drop-down menu and click All channels. D: Download CSV report. The channels report allows you to see data collected about all channels. What happens when I click on a channel in channels analytics? Professional group plan admins: Clicking into a channel shows the overall time duration of a channel, the number of members, and the average completion of the channel. 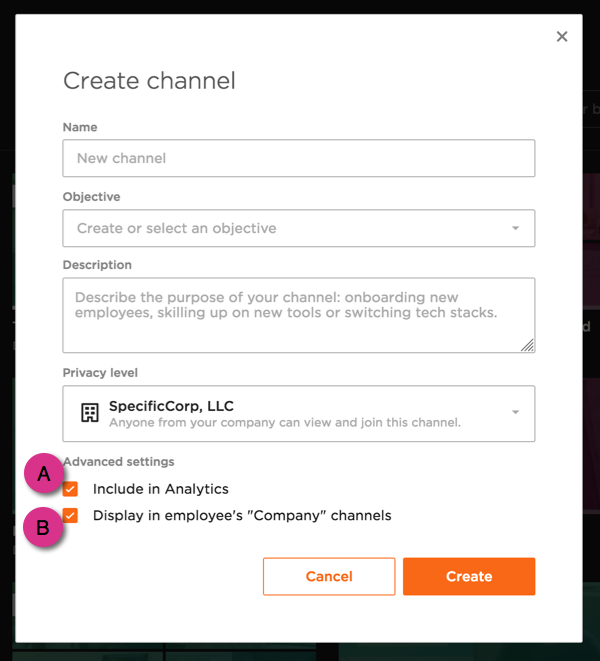 Enterprise group plan admins: Clicking into a channel shows all the information that Professional has, as well as your members who’ve viewed the channel, which team they're on, if they can view or edit the channel, the date that they joined the channel, last activity, and how much they’ve watched in the channel. Read our getting started with advanced channels analytics article to discover more. Both Enterprise and Professional group plans have access to the basic channels report download in the upper right-hand side of the screen. What are my most-watched and most-joined channels? Who creates the most channels on my group plan? What are all my organization's channels with a "Skilling up" objective? Which channels are watched all the way through? Which channels don't have much traction? Question: Which learners are part of this report? Does it show learners that used to be on the plan, but have been removed? This report shows the learners that are currently on your plan and who are members of the channel. Learners that have been removed, won't appear in the report. Question: What do team managers see in channels analytics? Team managers see the full list of channels in channels analytics. When a team manager clicks on a channel to view advanced channel analytics, they see the learners on their team that are channel members, as well as their progress -- even if they haven't watched any content. If a team manager clicks on a channel that doesn't have any team members as channel members, the team manager will see the message, "It looks like none of your team members are in this channel." Question: Is this a real-time report? Yes, all data is real-time on the channels report. Question: How do I hide a channel from analytics? Go to Channels, then create or edit a channel. Uncheck the Include in Analytics checkbox. See A below. Note: You must be the channel creator or group plan admin to edit this setting. Question: Can I choose just a certain date range? At this time, both the channels analytics page and the channels CSV report download show all-time channels usage. Question: Do people on my business plan, who watch courses on a channel without joining it, appear in channels analytics? No. Your learners must be members of the channel to appear in channels analytics and the report download. Company-wide channels and sharing a link with a learner do not cause your learners to become members of those channels; they must click Join or be added as channel members to have their progress tracked in channels analytics and the channels report download. Question: When a channel’s share status goes from "private to the business" to "anyone you share the link with," does that channel get removed from the channels analytics? Yes, the channel will be removed from analytics. If you change the channel back to "private to the business," the channel will re-appear in channels analytics, and all the viewing data will be restored and visible. Remember, only channel members' progress will display in channel analytics. Progress from learners on your business plan who aren't in the channel, will not display in channel analytics, regardless of whether the channel is "private to the business" or "anyone you share the link with." You now know the basics of channels analytics. Enterprise users, please explore our getting started with advanced channels analytics article. In it, we'll take a look at data found in advanced channels analytics.